Music has been a huge part of my life for as long as I can remember, from piano to guitar (and ukulele!) through broadway jazz, choral singing and finally a vocal performance minor in college. I think that's when my (very one sided) love affair with Eric Whitacre began. Put aside for a moment the fact that he is indeed a total dreamboat and completely crush-worthy for most women out there, and let's focus on his music for a second. 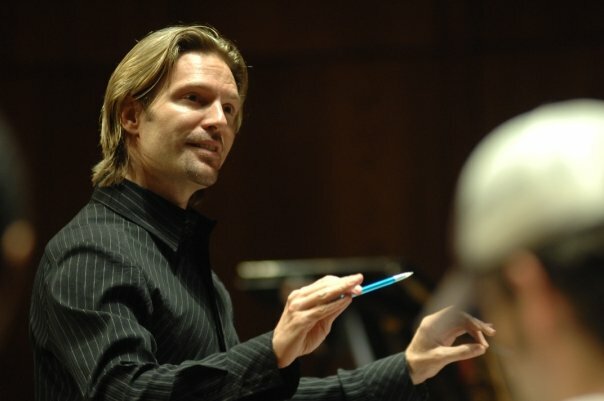 Eric Whitacre is in my (admittedly amateur) opinion one of the great composers of our lifetime. His music is faceted, brilliant, and above all, tells stories. Known to most for his stunning choral compositions, Whitacre also composes for various orchestral settings, and though I have a penchant for choral music, his instrumental compositions are equally (if not more) riveting. Take a listen to "Equus", for example - you can hear that horse galloping through the entire piece. Whitacre put his latest album, "Water Night" on Spotify with bonus tracks for each song; recordings of him telling stories about how each composition came to be. Give it a listen if you have some spare time and mental space, it makes the music that much more special. On our 2006 Europe Tour, our University Choir (Cal Poly University Singers & Polyphonics) performed one of Whitacre's most famous pieces: Sleep. The original piece was set to a poem by Robert Frost called Stopping by Woods on a Snowy Evening, but due to licensing issues he had to rewrite the lyrics to the piece. Below is the recording, as well as the original poem and the replacement lyrics. To me, the most beautiful thing he's done so far is adapt the popular children's book "Goodnight Moon" into a lullaby. In the recording below, you can hear his wife sing the piece, which was written for their son. *Note: I don't hold licensing for this music and am making no profit through this post.